Born in Odense in Denmark, Panton became on of the country's leading designers, specialising in brightly coloured plastic furniture. 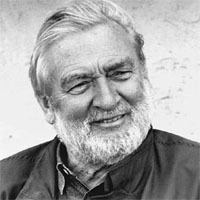 After graduating from the Royal Danish Academy of Art in 1951 he worked briefly for Arne Jacobsen before starting his own architectural practice and, like Jacobsen, moved into furniture design. In the 1960s he became the designer of the very first single-form injection-moulded plastic chair - the Panton S chair or Stacking chair. The S chair became something of a symbol of 1960s chic design and it has retained its popularity ever since.